In this third post in a series on mental ray for Maya 2016 Render Settings, we assume you are familiar with the concepts presented in the introductory post and the second post on adjusting quality. We recommend physically-based materials and lights to fit a modern workflow. In this post, we focus mostly on the materials, and we will follow-up with more posts on lights. These materials are designed to work more compatibly with unified sampling, and the simpler UI quality controls. They provide the flexibility of balance in adjusting global vs. local sampling quality controls. The Layering (MILA) material not only provides better compatibility with unified sampling and quality controls, but it also provides simple passes which can help you to adjust the quality settings. For example, this interior scene using mila materials clearly demonstrates the difference between direct and indirect lighting. The left picture has no indirect diffuse lighting as it is turned off in the Render Setting Quality tab, and the right picture has Indirect Diffuse (GI) Mode turned On with a depth of 4. Note that the 2 pictures below are organized in a gallery, so that if you click on them, you can see a larger version. Click on x upper left to get back to this page. The direct lighting quality is controlled with Lighting Quality, while the indirect quality is controlled with Indirect Diffuse Quality when Indirect Diffuse (GI) Mode is On. If using mila_materials, we can easily turn on the direct_diffuse and the indirect_diffuse passes in the Scene tab under Camera>Passes. Then, we can see the relationship between the pass results with respect to their quality. Note again that the 4 pictures below are organized in a gallery, so that if you click on them, you can see a larger version, and step through each with a right, left arrow. Below we increase the Indirect Diffuse (GI) Quality to reduce noise in that pass. Use the (MILA) Material Quality to address noise caused by the material sampling. For the layering library (MILA) materials with either glossy reflection/transmission or scatter components, the Material Quality controls the number of samples, ie the outgoing rays split out from the interaction of the material with an incoming ray. In a sense, this is the indirect quality aside from the indirect diffuse, i.e., the indirect glossy and scatter components. When Advanced Settings are on, we provide separate Glossy Quality and Scatter Quality controls in case the noise differs significantly between these components. Note that the material quality settings are relative, so controlling Material Quality will continue to control both glossy and scatter quality. The material quality is multiplied by glossy or scatter quality to determine a quality for each respective component, with all defaults at 1.0. 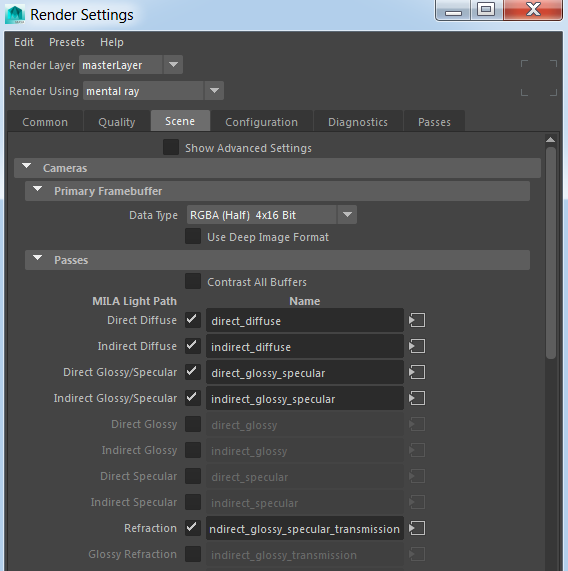 Note that the passes for indirect glossy/specular and scatter directly correlate in quality to these settings. Note that for the MILA shaders, we provide quality settings by scene. In other words, all the materials in the scene share the settings. This makes it easier to control in a typical scene with many materials, rather than per-shader. It also allows the renderer implementation to optimize better. 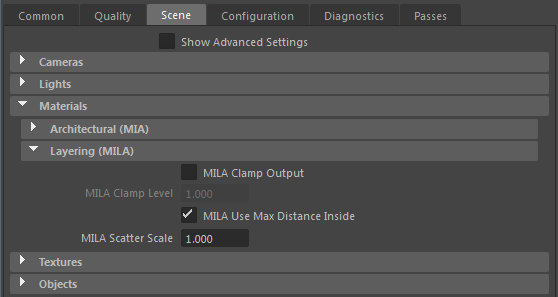 Besides quality, we have several other useful render settings that are shared by the mila materials. They are in the Scene tab in the Materials section. Clamps the output of mila_material. This is an enable, for using the clamp level. If off, light transports through the scene in the most physically-accurate way, though with high dynamic range lighting, more quality may be required. The default is off. The level used for clamping, typically between 1 and 10, based on desired output. When making a material to model colored glass, not only do transmission paths inside the glass need to be colored, but also, if one of those paths reflect inside the glass again (internal reflection), it should be colored. Depending on your scene, this may be more or less subtle of an effect visually. A material with a reflection component could be on the outside or the inside, so the max distance parameter for a reflection component needs information as to whether it is modeling physically-correct internal reflection, or modeling the legacy max distance render trick for the external reflections. We recommend using colored max distance primarily for internal reflection, when combined with a transmission component, and therefore, make this the default. Use the max distance for reflection internally for colored glass. On is the default. If off, the max distance is used for external reflections, those bouncing off the outside of an object, instead of internal reflections. Modern rendering uses more quantities that depend on scene units, such as the distance to scatter with mila_scatter. In the Materials section of the Scene tab, we provide a global scaling factor for scatter distances. The MILA Scatter Scale is very convenient for re-using materials across different size scenes. It multiplies by the local scale control, if exposed, in the (MILA) scatter component. Below we show how increasing the scale makes the scatter pass look more like the diffuse pass, with less and less scattering. For practically good results the scatter pass should look barely noticeable when mixed in with all the other passes. At SIGGRAPH 2015, I noticed how many users were still concerned that the number of layers in a material may affect performance. For modern materials, such as MILA and MDL, this should not be of concern. The elemental component structure provides the renderer with this ability. The material can either be selectively sampled or flattenend for a single minimal BSDF representation, and as the depth of a ray increases, more optimizations can occur. All lights in this section default to quadratic falloff for physically-based lighting, and compatibility with the modern techniques including Light Importance Sampling (LIS). With LIS, the Lighting Quality can be used for direct lighting quality. In our next post, we will introduce the Physical Area Light, and in another post we will provide more detail for the Object Light, which is a special case of the Physical Area Light assigned to an object for emission. 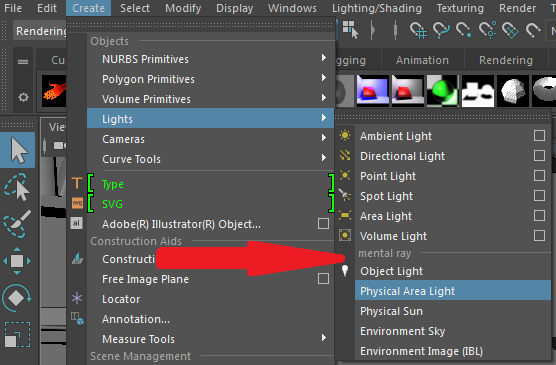 We will also provide a post on how to use the newly packaged Environment Lights. I’m waiting for the next post on PhysicalAreaLight envLight and objectLight. Physical Area Light is the next one coming. Anything in particular you are waiting to find out about it? I for one am interested in why a separate light card creates far less noise in the glossy component of mila materials then using the primary visibility of the PhysicalAreaLight. Hi! Can you please tell me how can i connect the photographic exposure with physical sky? Because the miSkyExposure attribute node disappear in 2016. Thank you! Planning separate blog posts for each of physical area light, object light, environment lights. Good point about the scene scale, which I’ll incorporate in the presentation. Area and object light use the same shader, mila_light, so noise, and therefore, render time comparisons are related to the light sampling of the different shapes. Planning separate blog posts for each of physical area light, object light, environment lights. Is this still in the works? Greatly look forward to it. Am studying to learn good workflows for MR in Maya. Yes, derailed timing a bit because of extra beta preparation and support. We want to incorporate a task-oriented style into the User Guide as well, so the doc, the beta, and the blog are all related. Hi, I’ve problems with big (for instance: Area Light = size of window, Object = size of an basketball) physical Area Lights and glossy reflections (roughness around: 0.6 – 0.75). I’ve got very much noise in glossy areas also with burned-out white sparks or dots in it (Intensity is not too high). I can not reduce them easily in the quality settings. I would have to increase the settings so havily, that the render would take really long for one frame. Is there an easy solution or workflow to reduce the noise without increasing the rendertime to extreme – for example a glossy blur, or something else. Or what is the right workflow to get good looking results. Did you try the MILA clamp mentioned in the blog post? Could you send us the scene, or put it in the forum to discuss? Another one is related to learning mila materials. Is a great chance a starting tutorial with some mila shaders and a repository free to all. I will be giving out more information regarding the mila_material layers, and especially discussing the base layers first. Older training material will be converted to use mila_materials. The older training material goes element component by component, and then combines. First reflection, diffuse, then specular, then glossy. Then transmission, specular, glossy, diffuse. Then mixing. Then layering. Then, paint, scatter, emission.